The news media are full of plans to attack Syria this evening. On Thursday, Parliament is to be recalled to debate such an attack. The Prime Minister, David Cameron, has returned early from holiday to ‘deal’ with the situation. At the same time, the US and France are making similar initial noises about an attack. I believe these rumours of war are wrong, and urge politicians to think again. On a personal note, I have been a regular visitor to Syria over the years, for research, study and leisure. I love Syria and its wonderful people. Over the last year, I have had quite a few terribly sad conversations with Syrian friends about the rapidly deteriorating situation. A line has been crossed: chemical weapons have been used in Syria. Most likely they were deployed by forces loyal to Bashar al-Assad. Yet there is still just enough doubt, even with a visit from inspectors, to shade any certainty. The use of chemical weapons is a clearly defined war crime. Yet no war crime precipitates a licence to wage war under international law: committing a war crime does not give an automatic right to bomb a country. International law strictly requires a UN Security Council resolution to wage war, and, with Russian and Chinese vetoes, that is not going to happen anytime soon. It seems to be the new ‘white man’s burden’ to police the world, rounding up its tyrants, yet any civilised police forces needs to operate within predefined laws and with public goodwill and consensus. Bashar al-Assad is a desperate dictator at the head of a complex power network. Forcing him back further into a diplomatic corner will almost certainly make him and his network more desperate, and capable of lashing out with untold consequences. Syria has entered a civil war. What began as peaceful protest, turned into violent protest when met with government violence, and has since become a full-scale civil war. Gradually, the opposition has shifted from the control of community groups and exiled critics of Assad into the hands of violent, opportunistic gangs, and those importing a religious fundamentalism alien to over a millennium of Syrian multiculturalism. Any military action will change the current balance of the civil war. This is not to say status quo is desirable, but neither necessarily is any shift in balance between two equally undesirable sides. Not one pot of coffee is brewed in the Middle East without international repercussions. There are Syrian refugees living precariously in Jordan, Lebanon and Turkey among other places. Iran and Hezbollah have a strategic interest in supporting Assad in their neighbourhood. As ever, if there is Western military intervention in Syria, however ‘surgical’, Israel will see what regional advantage it can make of the instability, which is likely to be an excuse to bomb sites in Syria, Lebanon and Iran. The West would be culpable for unleashing Israeli attacks. There is much angst about sitting by and doing nothing. ‘Appeasement’ has a bad rap historically, but it is a logical fallacy to ‘do something’ just because it is felt that something must be done. Military action is always believed to be a last resort, and thus a sign of failure and weakness. Rather than asking if this plan of action will result in a measurable improvement of the situation, it is done for the sake of doing. Of course, more diplomacy would be welcome, but the West has burnt so many of its diplomatic bridges already that it looks like careless arson. David Cameron should not look to his ‘success’ at bombing Libya, that had unseen consequences in Mali. Libya’s population is under 6 million, Syria’s is over 22 million. Syria’s large Christian minority are beginning to suffer greatly, in the midst of the general suffering. It cuts me to the heart, but I deplore those Christians outside of Syria who call for military intervention. Standing by is not the weak option. It takes wisdom and courage, when provoked to lash out, to realise that it will only exacerbate the situation, and that the true course of action is to stand firm. To desperate, and weep, yes, but still to stand firm. Categories: Christianity, Islam, politics, society | Tags: Assad, attack, Bashar al-Assad, bomb, bombing, civil war, Damascus, David Cameron, France, gas, Hezbollah, Iran, Israel, Lebanon, Libya, Middle East, Syria, UN Security Council, United States, war, war crime, war crimes | Permalink. As a Westcountry lad, and one rather taken by our folklore, I am gladdened to hear that Samantha Cameron has named her baby girl Florence Rose Endellion after the North Cornish village of St Endellion where the family were holidaying. Endellion was a 6th century ascetic who lived her life in isolation with only a faithful cow for company. She subsisted entirely on her cow’s milk. Endellion came from a large family of saints, children of King Brychan: including Nectan who carried his head after being decapitated by cattle rustlers, Morwenna who carried a stone on her head to build her church and Clether who was an unremarkable hermit. One day, Endellion’s cow wandered off, trespassing on the lands of the Lord of Tregony, who killed the cow for the damage it did. On hearing this, Endellion’s godfather, King Arthur (yes, he of the Round Table), slew Tregony in a rage. Overcome by the slaughter, Endellion wept over the corpses of Tregony and her dear cow, and they were both restored to life. 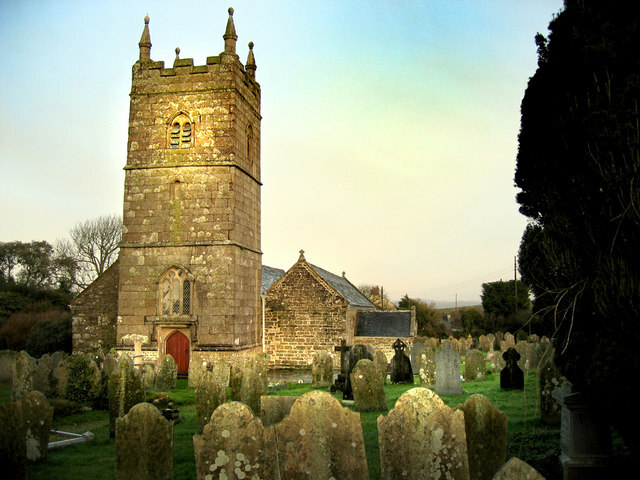 At her death, Endellion requested that her cow pull her funeral sled, and that she be buried where she stop, and that is where St Endellion’s Church stands today. There’s also an old chapel dedicated to Endellion on Lundy Island, opposite her brother Nectan’s stomping ground of Hartland. Cambridge’s famous Endellion Quartet is also named in her honour. If you enjoyed the story of St Endellion, you might just like the story of St Sidwell of Exeter, and her sister St Juthwara who rubbed cheese on her breasts! Categories: Christianity | Tags: ascetic, baby, breasts, Brychan, chapel, cheese, church, Clether, Cornish, Cornwall, cow, David Cameron, Devon, Devonian, Endellion, Endellion Quartet, Exeter, Florence, girl, girl's name, Hartland, head, hermit, Juthwara, King Arthur, Lundy Island, milk, Morwenna, name, Nectan, Rose, saint, Samantha Cameron, Sidwell, St Endellion, stone, Tregony, Westcountry | Permalink. I remember the feeling when Tony Blair became prime minister, Labour came to power and the long, ugly Tory rule that had existed for most of my life was ended. It was May 1997; the weather was good, the cricket was good, the politicians were good. I wasn’t a member of the Labour Party then, but I voted Labour, and was desperate to see the change that Tony Blair promised. Of course, I was naive, but back then we were willing to give Tony a lot of rope as long as he got us in. Categories: politics, socialism | Tags: Blairism, BNP, David Cameron, devolution, Gordon Brown, House of Lords, Labour, Labour Party, Lib Dems, Maggie Thatcher, Michael Foot, minimum wage, neoliberalism, New Labour, NHS, SDP, social democracy, socialism, Thatcherism, Tony Blair, Tories | Permalink. I wasn’t sure exactly what to expect from More4’s When Boris Met Dave last Wednesday night, and well timed to air just before David Cameron’s speech to the Conservative Party Conference. As I work at Oxford University, I’ve seen a little of the silliness that the place induces in those who ‘come up’. The Bullingdon Club, a silly little ongoing stag party for posh boys, still exists: everyone hates them, nobody likes them. They are mostly ignored until they get a mention in a student rag for destroying some restaurant or college quad. Their tailored coats and posh accents shouldn’t distract you from the fact that they are drunken vandals. Their more open ideological neighbour, the Oxford Conservative Association, was recently suspended from the students’ union for asking candidates to tell a racist joke at hustings (This article in the Cherwell says that the Conservative Party has quietly taken on the racist club as its official branch at the university). Then the rugby club went on the piss round town dressed as ‘comedy Jews‘. So, the Buller is just a part of the stupid hierarchy of trainee fascists at the university. Categories: politics | Tags: Boris Johnson, class, classism, David Cameron, politics, toffs, Tories | Permalink.